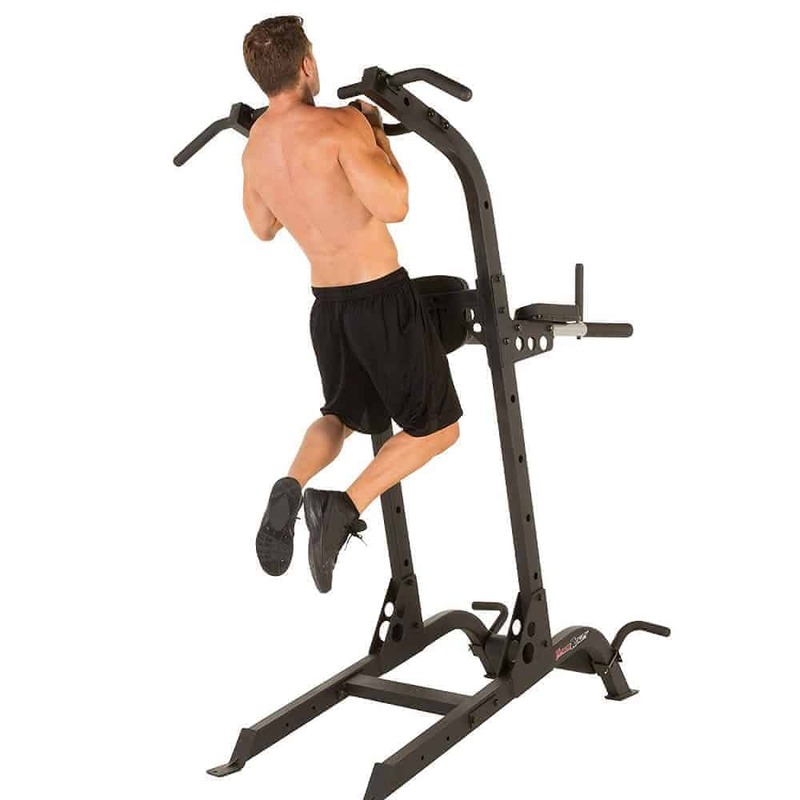 I have just received an email in which a guy was searching for a commercial grade pull up dip station. He is a professional in calisthenics who wants to do bodyweight exercises with additional weights. Moreover, he is over 230 lb, and he needs equipment which is suitable for doing muscle ups. Get a power rack which comes with a pull-up and dip bars. Racks are heavy duty and great tools for lifting weights safely. I also suggest him to consider a premium wall mounted pull up bar and a robust dip station to buy. And finally, the Fitness Reality X Class High Capacity Multi-Function Power Tower. 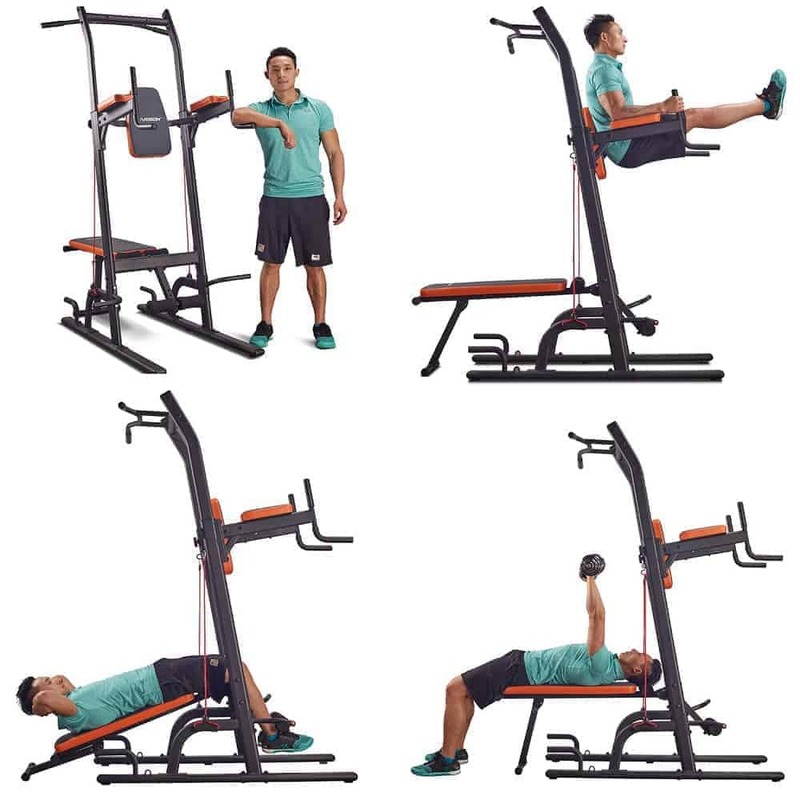 He picked the last one because he does not have much space at home and that tower comes with all the functions that are required to perform the most beneficial bodyweight moves. Below you can find more information about it. 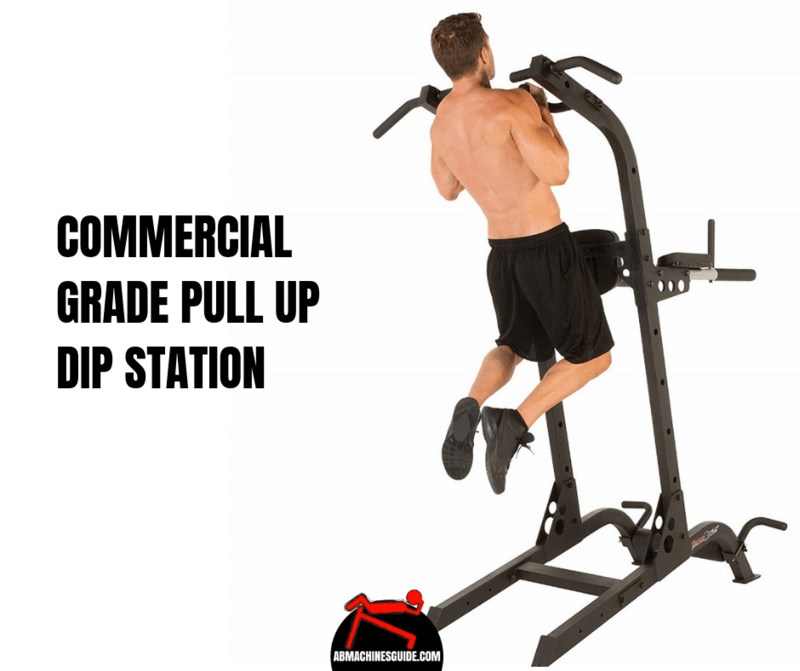 What makes it a commercial grade pull up dip station? The frame is a thick 11 gauge steel construction that is why it has a higher maximum weight capacity than typical power towers. It can be used up to 400 lb which is enough for even pro athletes like the mentioned guy. Actually, some people use it with additional 50-60 lb for dips and pull-ups. It can also be found in many commercial gyms as well. But, because of this extra heavy duty steel tube frame, it is 150 lb so relocating is not easy. So, you need a dedicated space for it. You get 10 years warranty on the frame, 3 years on other parts, and 2 years on wearable pieces such as the backrest. It is a fact that heavier an exercise equipment, the more stable it is. But, Fitness Reality has an off the ground angled base which makes it even more stable. And if that was not enough, there are pre-made holes for drilling it down to the floor. Users do not complain about wobbling, and it feels very solid under usage. I think, fixing to the floor is only necessary if you want to the muscle ups or the total load is over 300 lb. Now let’s see the various station. 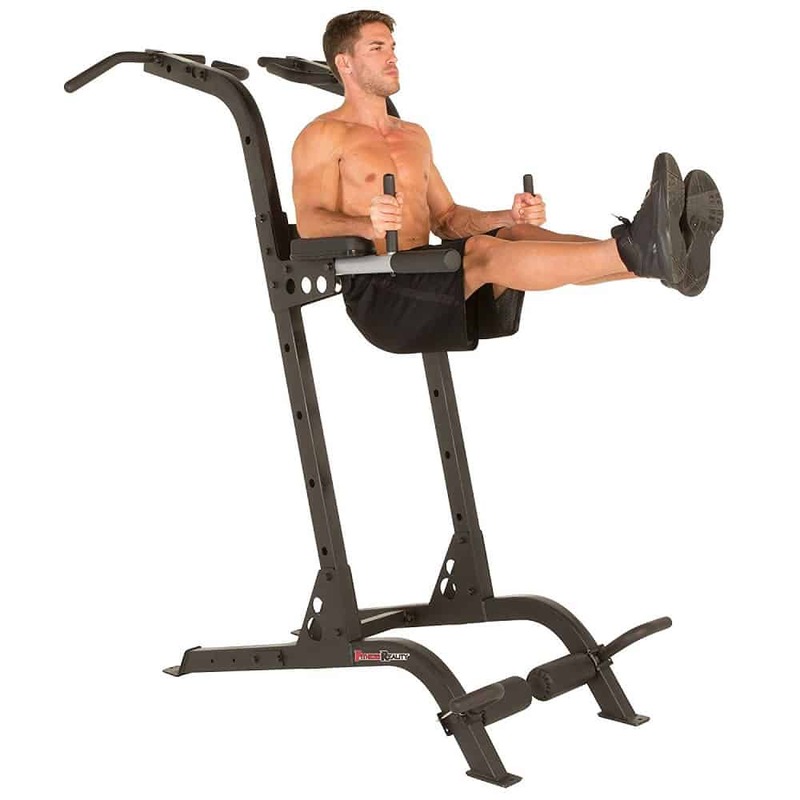 Vertical knee raise station has a backrest which is not vertical but a little bit angled. This way it provides more comfortable back support. Also, the handles can be adjusted in two positions to find a better grip. Finally, the arms rests are also angled a little bit inside for comfort. Thanks to these features you can perform the vertical knee or leg raise more comfortably, safely and effectively. Standard towers come with a single bar, but Fitness Reality provides multiple ways to perform pull ups and chin ups. You can do wide, narrow or hammer version to strength training your entire upper body. Also, the height of the machine is 83 inches which is higher than average. Hence, taller people can use it comfortably. The distance between the dip handles is 26″ which is suitable for most of the people. Although, some shorter individuals may find it a bit wide. The 2″ thick dip handles are covered with foam for comfortable and safe exercising. Since the tower has an angled base, you can step on it to mount yourself on the dip bars. 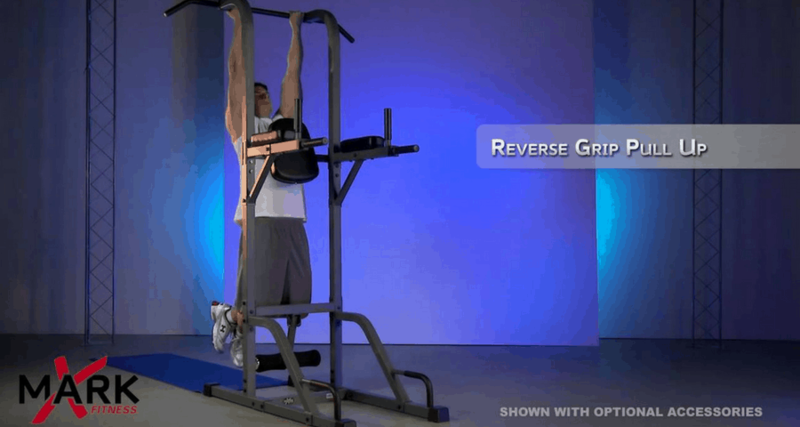 You can adjust the push-up bars in 7 positions on the upright. This way you can do even more types of exercises. For example, decline or incline push-ups, assisted dips or body rows. This function is particularly beneficial for beginners who need progressive exercises to perform such bodyweight exercises like pull ups and chin ups. Besides, advanced athletes can make their workouts more versatile or have higher reps. Even is it seems a complex machine but putting it together is not complicated. Everything is included in the box. From my experience, the best is if you fully tighten the bolts after putting it together. Since it is a big home workout equipment, it comes in two boxes. Verdict/ Is it for you? As you see, we are not talking about a typical power tower, but a premium commercial grade pull up dip station. It is far more robust and convenient to use than other models. It is a good buy for everyone who wants to bodyweight workouts at home. It costs more, but you will get quality home gym equipment serving you for long years.